Someone has claimed to hack the Twitter account of the president and co-founder of Riot Games, the makers of League of Legends, using it to publish images and templates from a completed-but-unreleased League of Legends card-based game. "Riot doesn't want you to play this game," said "Jason," the hacker. 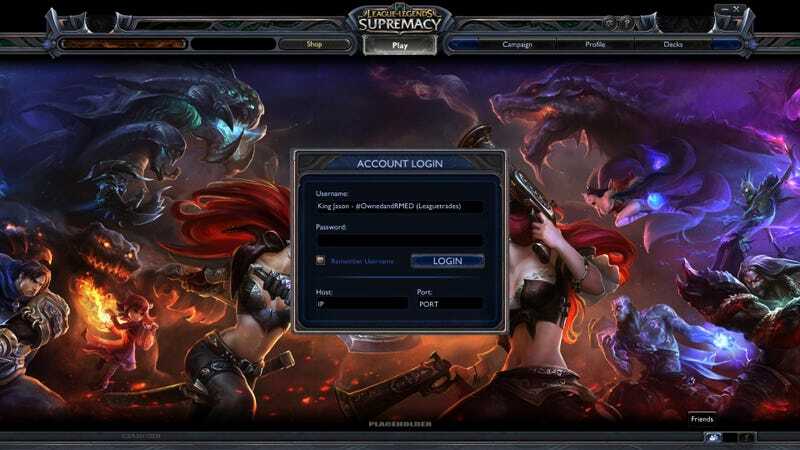 The hacker then linked a picture of placeholder login screen artwork for "League of Legends: Supremacy," seen above. That name was registered as a trademark (and in a series of web domains) by Riot Games a year ago, which gathered some attention at the time. Speculation had it that the name referred to a mode within the main League of Legends game, and little more was said after that. "It's a standalone game," said the hacker in this tweet. "I have the server and client source." "Jason" later made this threat. He then backed off that threat, saying about an hour after the takeover "I have decided to give marc his twitter back." Kotaku emailed a Riot Games representative to inquire about the breach, the veracity of the images and Riot's plans for any new League of Legends game under the name Supremacy. We'll update this story with any reply we receive. [UPDATE]: Merrill has retaken control of his account and deleted the hacker's Tweets, but confirmed that someone else took control the feed. As for "League of Legends: Supremacy," Merrill said the images in question are old and experimental in nature, and not evidence of any game that was due for release.